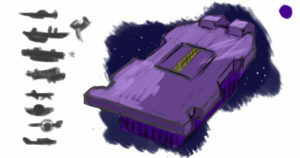 With how little time I’m still having to complete these drawings, I’m now filing them under speed paintings as well. I tried a technique I saw from a few different artist forums for brainstorming: make a couple of very simple shapes with a large brush as a kind of silhouette of what you want to sketch, then pick one and start filling in details. Even great artists can produce objective garbage once and a while. Anyone who is intimidated by the skill and craft of another person who has had years of training, practice, and experience more than you can take comfort knowing that you are more talented at something that they are not. With practice of your own, you can catch up to the masters that you idolize, even learning from their work. 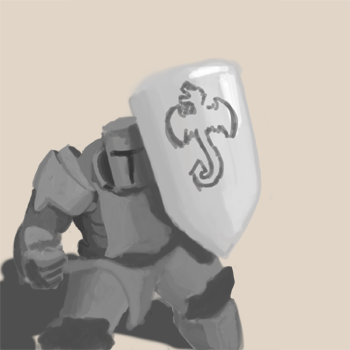 Behold, my garbage first speed painting. Speedpainting, so everyone knows what this was supposed to be, is the goal of rapidly sketching and painting in the major items into your piece so that you can arrange the composition, shapes, and colors of the painting. The idea is to have everything in place except the details in 30 minutes to an hour. It forces you to make decisions on a larger scale for your piece so that you don’t spend endless hours painting and repainting without ever finishing. 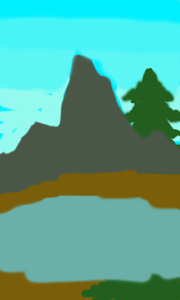 This was supposed to be a mountain next to a lake, and I did everything that I wasn’t supposed to. It looks like I fingerpainted it with my thumb after it had been severed in a bizarre desk adjustment accident, and that glorious piece of garbage took 35 minutes. A toddler does better work than that, faster, and has an art gallery on the fridge to display their work to their adoring public. I have a blog that maybe my friends read out of politeness when they haven’t seen me in two months and after reading this are probably wondering whether or not they need to do an intervention. Don’t worry. The point I’m trying to make is, you are going to be objectively terrible at something the first time you try it. What you produce is not going to match the idea in your head of what it is supposed to look like, and that’s okay. Be proud that you did it, and be curious enough to learn what you did wrong. Then be brave enough to try again and apply what you learned so you get better. Keep at it. I am. I’ll post the next speed painting soon.